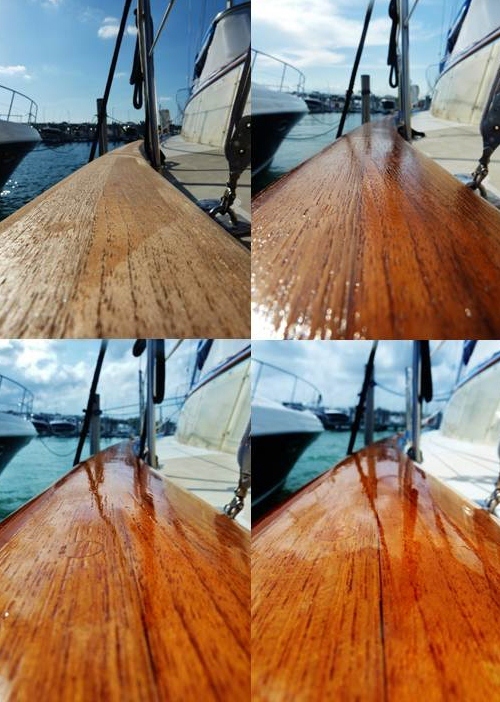 When Eric and I first began boat shopping, one feature we kept an eye out for was the amount of exterior teak found on each boat. 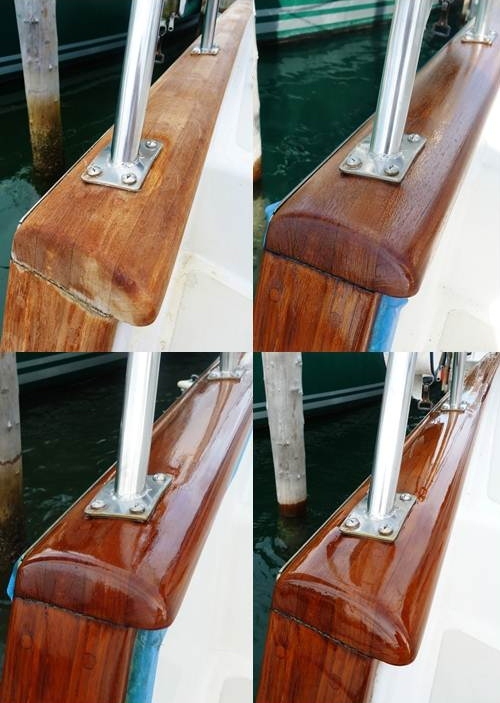 While beautiful, a lot of exterior teak means a lot of maintenance, which equals either a lot of time or a lot of money. For her size, Sea Gem has a moderate amount of exterior teak; however, her size is large, and even a modest amount of teak is a lot. 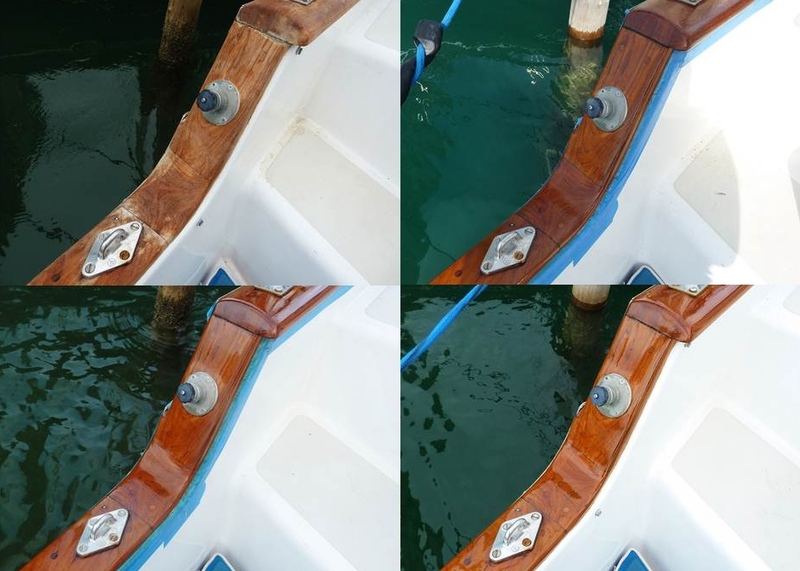 Sea Gem's woodwork was actually one of the first things we noticed about the boat because it was absolutely perfect--a gorgeous color and a brilliant shine. The secret? Awlbrite, a clear acrylic urethane topcoat that the previous owners had applied directly to the naked teak. 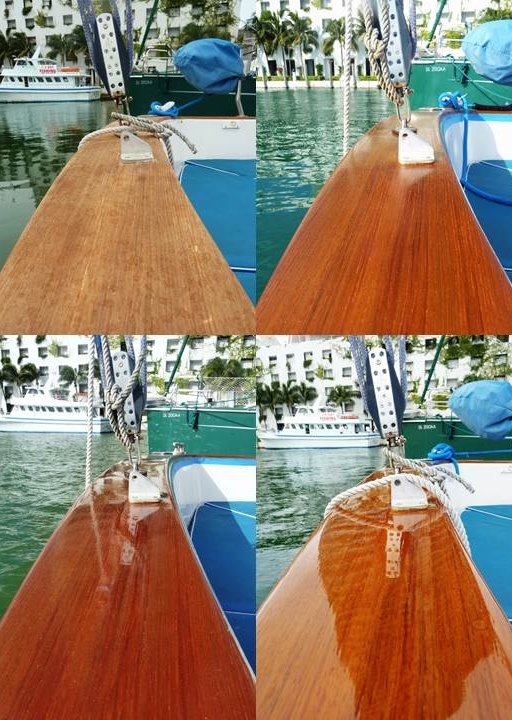 Eric and I both knew maintaining Sea Gem's teak would be a challenge, but we were up for it. In fact, we were all set to start sanding and applying a fresh coat (or coats, rather) of Awlbrite, but then we found out I was pregnant. Since the inhalation of fine teak partials and caustic fumes doesn't mix well with pregnancy, we decided to hold off on refreshing the woodwork. As my pregnancy progressed, our once shiny teak lost its luster and its top coat turned brittle and began to chip. It was sad--like watching a perfect manicure fade away. We knew we needed to do something in order to keep the wood protected, and since it would be awhile before we could do the work ourselves, Eric began researching low-maintenance options for keeping our teak in shape. He finally settled on Teak Guard. I was not pleased. While I have no doubt Teak Guard works well, I really didn't want it applied to Sea Gem's wood. I felt like this product is to teak what self-tanning lotion is to skin. Thankfully, I was pregnant, and as most ladies (and many men) know, pregnancy doesn't just yield babies--with it comes "push gifts." At first, I thought the idea of a push gift was a bit silly; however, as I watched my once athletic body slowly morph into a lumpy pear-shape, while at the same time endured 9 months of other "joys," I suddenly felt deserving of a little compensation. So, for my push gift, Eric spoiled me with fancy, professional teak work. I'm guessing that most push gifts don't typically contain as many chemicals as the one Eric got for me, but that's OK--I couldn't be happier with the present I received. I'm just hoping that I don't need to have a baby each time our teak needs touching up. OMG it looks so beautiful and after taking Child Health and the environment, many of the husbands in my class took over all of the cleaning duties for their pregnant wives. Believe me when I say that Dr. Gerstenburger received many a thank you note from the wives of students. This reminds me of the my canoe club's koa racing canoes. It just gleams in the sunlight.